This design is also found with additional enamel coloring. This example was lot 228 in the Bonhams sale on the 23 January 2008 of the Sir Jeremy Lever collection . 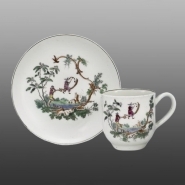 This Worcester tea bowl and saucer is transfer printed in black with Les Garcons Chinois. Sometimes the print was tinted with delicate enamel colors. This design is heavily influenced by Pillement and shows two Chinese boys climbing amongst rococo scroll work. One is sawing through the scroll on which the other is seated. The pattern was also produced in underglaze blue at Worcester but examples are rarely found. It seems that the copper plate was not reworked for use with underglaze blue and sometimes the resulting blue impression is poor. The pattern is also found in underglaze blue on Isleworth porcelain.